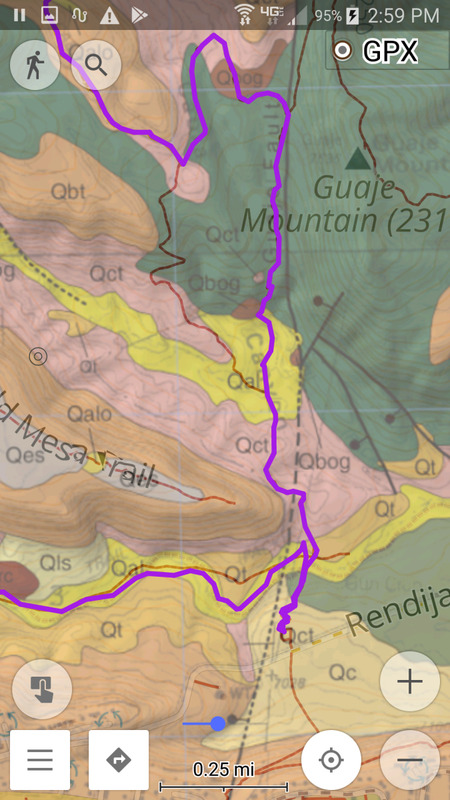 For many years I've wished I could take a raster map image, like a geology map, an old historical map, or a trail map, and overlay it onto the map shown in OsmAnd so I can use it on my phone while walking around. I've tried many times, but there are so many steps and I never found a method that worked. 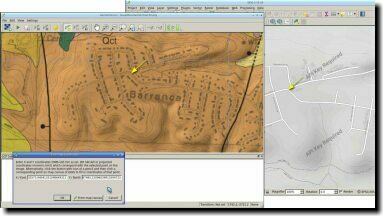 Last week, the ever helpful Bart Eisenberg posted to the OsmAnd list a video he'd made: Displaying web-based maps with MAPC2MAPC: OsmAnd Maps & Navigation. Bart makes great videos ... but in this case, MAPC2MAPC turned out to be a Windows program so it's no help to a Linux user. Darn! 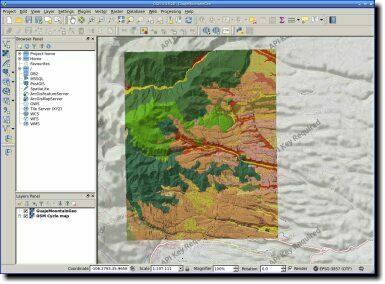 The first step is to georeference the image: turn the plain raster image into a GeoTiff that has references showing where on Earth its corners are. 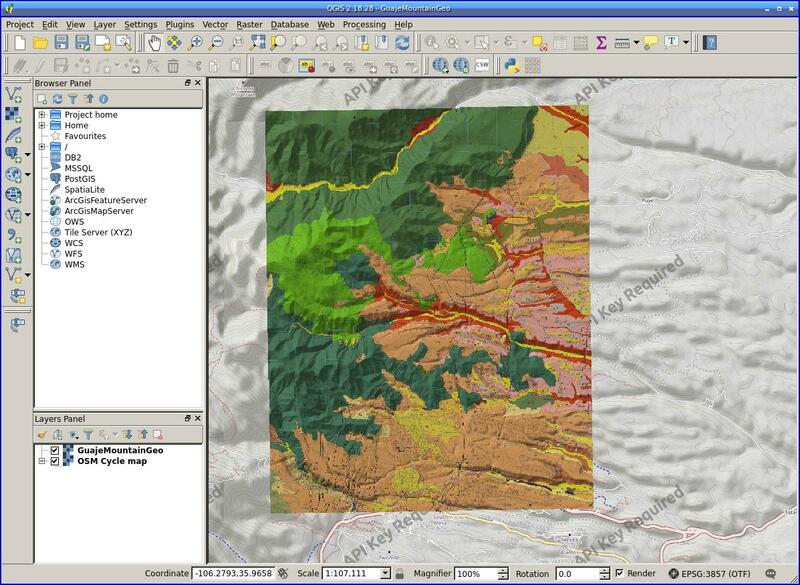 It turns out there's an open source program that can do that, QGIS. Although it's poorly documented, it's fairly easy once you figure out the trick. 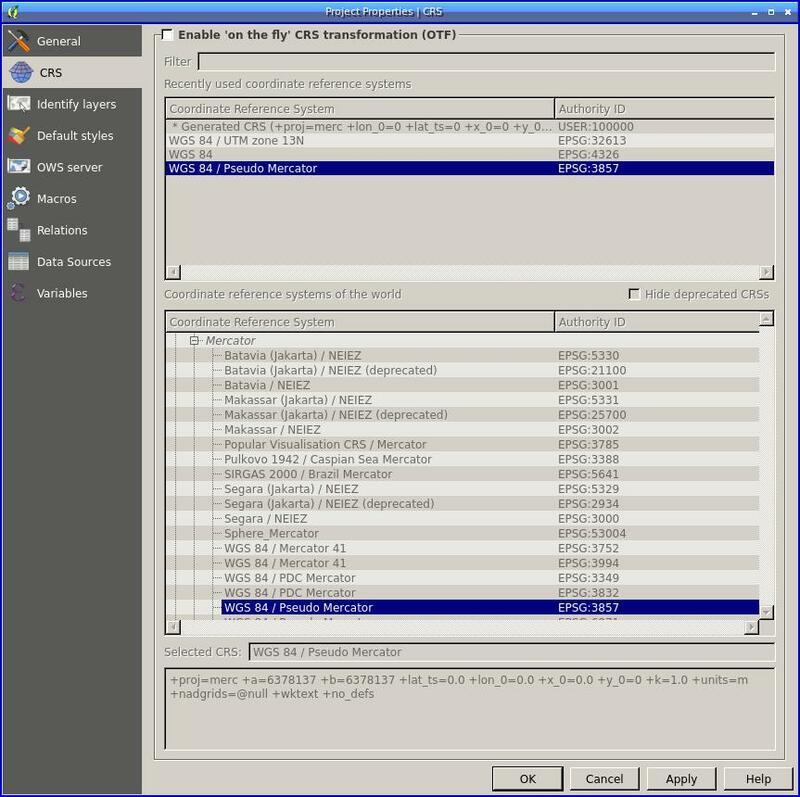 Instead, follow BBRHUFT's advice and type 3857 into the filter box in both windows. 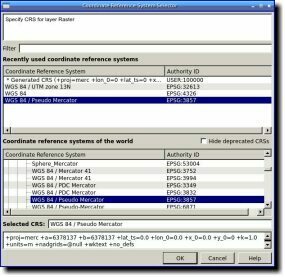 The "WGS 84 / Pseudo Mercator" CRS will show up and you can use it in both places. Then the GeoTiff will come out in the right place. If you're starting from a PDF, you may need to convert it to a raster format like PNG or JPG first. GIMP can do that. Start qgis, and bring up Project > Project Properties. 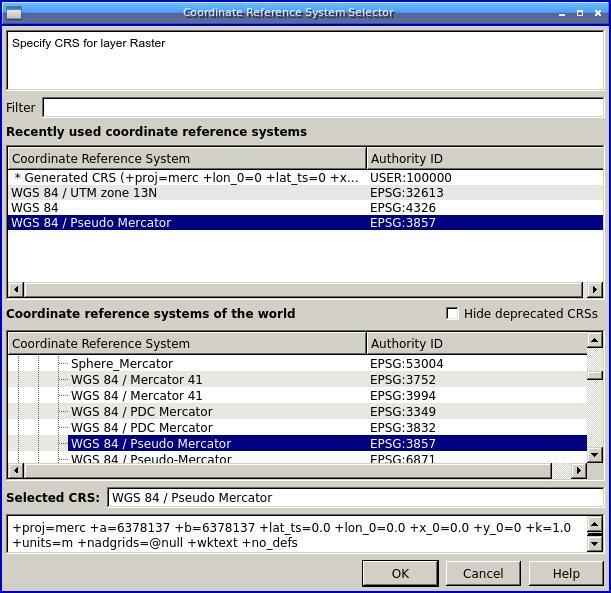 Click on CRS, type 3857 in the filter box, and make sure the CRS is set to WGS 84 / Pseudo Mercator. (optional) While you're in Project Properties, you may want to click on General and set Display Coordinates Using: Decimal degrees. By default qgis always uses "meters" (measured from where?) which seems like a bizarre and un-useful default. 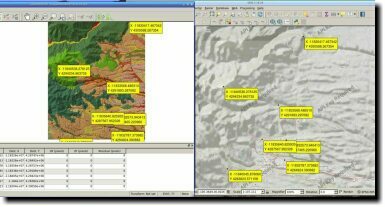 In Plugins > Manage and Install Plugins..., install two plugins: Quick Map Services and Georeferencer GDAL. Back in the main QGIS window, go to Web > QuickMapServices (that's one of the plugins you just installed) and pick a background map, probably something from OpenStreetMap. Once you find one that loads, navigate to the area you're interested in. Start the georeferencer: Raster > Georeferencer > Georeferencer.... It may prompt you for a CRS; if so, choose WGS 84 / Pseudo Mercator if it's available, and if it's not, type 3857 in the filter box to find it. Select matching points. This part is time consuming but fun. Zoom in to your raster map in the Georeferencer window and pick a point that's easy to identify: ideally the intersection of two roads, or a place where a road crosses a river, or similar identifying features. 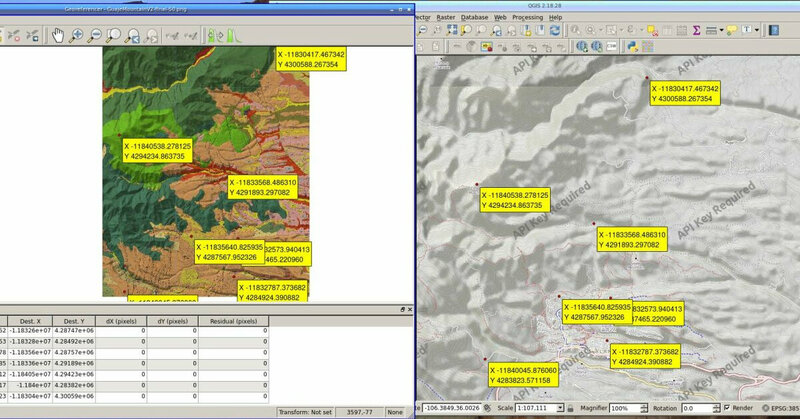 Make sure you can identify the same point in both the Georeferencer window and the main QGIS window (see the yellow arrows in the diagram). Click on the point in the Georeferencer window, then click "from map canvas". 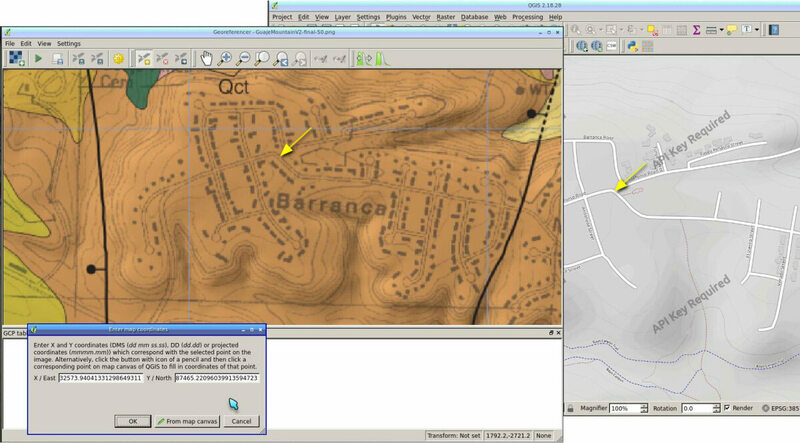 In the main QGIS window, click on the corresponding point. You can zoom with the mousewheel and pan by middle mouse dragging. Repeat for a total of four to eight points. You'll see yellow boxes pop up in both windows showing the matching points. If you don't, there's something wrong; probably your CRSes don't match. In the Georeferencer window, call up Settings > Transformation Settings. Choose a Transformation type (most people seem to like Thin Plate Spline), a Resampling method (Lanczos is good), a target SRS (make sure it's 3857 WGS 84 / Pseudo Mercator to match the main window). Set Output raster to your desired filename, ending in .tiff. Be sure to check the "Load in QGIS when done" box at the bottom. Click OK. File > Start Georeferencing. It's quite fast, and will create your .tiff file when it's finished, and should load the TIFF as a new layer in the main QGIS window. Check it and make sure it seems to be lined up properly with geographic features. If you need to you can right-click on the layer and adjust its transparency. In the Georeferencer window, File > Save GCP Points as... in case you want to go back and do this again. Now you can close the Georeferencer window. 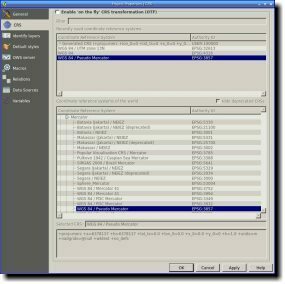 Project > Save to save the QGIS project, so if you want to try again you don't have to repeat all the steps. 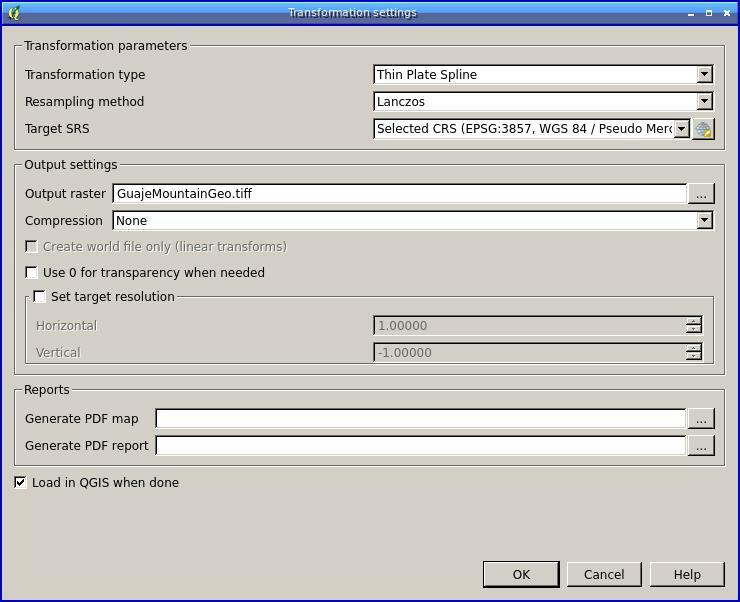 Now you can close qgis. Whew! The ultimate goal is to convert to OsmAnd's sqlite format, but there's no way to get there directly. First you have to convert it to map tiles in a format called mbtiles. QGIS has a plug-in called QTiles but it didn't work for me: it briefly displayed a progress bar which then disappeared without creating any files. Fortunately, you can do the conversion much more easily with gdal_translate, which at least on Debian is part of the gdal-bin package. So easy to use! Most of the other references I saw said to use Mobile Atlas Creator (MOBAC) and that looked a lot more complicated. Incidentally, Bart's video says MAPC2MAPC calls the format "Locus/Rmaps/Galileo/OSMAND (sqlite)", which might be useful to know for web search purposes. Once you have the .sqlitedb file, copy it to OsmAnd's tiles folder in whatever way you prefer. For me, that's adb push file.sqlitedb $androidSD/Android/data/net.osmand.plus/files/tiles where $androidSD is the /storage/whatever location of my device's SD card. Then start OsmAnd and tap on the icon in the upper left for your current mode (car, bike, walking etc.) to bring up the Configure map menu. Scroll down to Overlay or Underlay map, enable one of those two and you should be able to choose your newly installed map. You can adjust the overlay's transparency with a slider that's visible at the bottom of the map (the blue slider just above the distance scale), so you can see your overlay and the main map at the same time. The overlay disappears if you zoom out too far, and I haven't yet figured out what controls that; I'm still working on those details. Sure, this process is a lot of work. But the result is worth it. 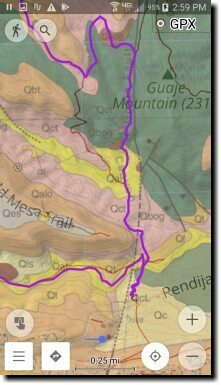 Check out the geologic layers we walked through on a portion of a recent hike in Rendija Canyon (our hike is the purple path).